Editor’s note: Jasmin Lilian Diab submitted her following personal story to Global Young Voices. You too can submit yours to us here. The Lebanon Dialogue Initiative (LDI) is a civil society movement supported by various academic, business and civil society organizations. It hopes to designate Lebanon as a universal land of dialogue, establish an international center for dialogue in Lebanon, and contribute to conflict reduction, reconciliation, social justice and peace building. It also strongly hopes that Lebanon will be able to secure the international solidarity it needs to recover its historic vocation — one to which Lebanon still manages to be faithful. LDI was created in 2013 by William Zard Abou Jaoude, Dr. Edward Alam, and Dr. Guita Hourani; together, they selected Notre Dame University to lead the initiative. The three were later joined by Dr. Salim Sfeir, Dr. Moise Khayrallah, Dr. Habib Jaafar, Dr. Youssef Rahme, Mr. Amin Nehme, Dr. Nick Kahwaji, Ms. Rouba el -Helou, Mr. Bahjat Rizk, and many others. LDI is housed at Notre Dame University and operates as a non-profit organization with a Memorandum of Understanding (MOU) that governs its relationship with the university. Mr. Suheil Matar, Vice President for Public Relations and Communication at NDU, is the spokesperson of LDI. 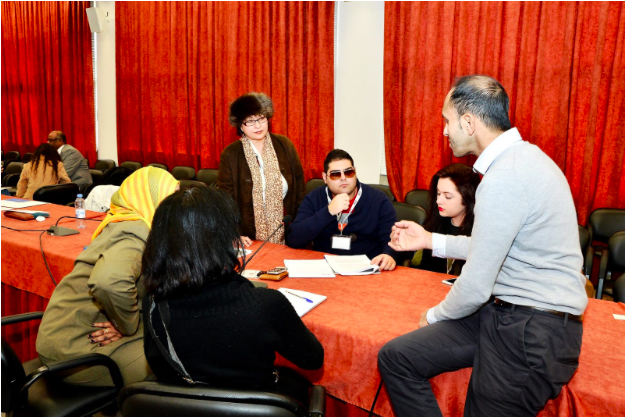 As the Operations Manager and Youth Coordinator of the Lebanon Dialogue Initiative (LDI), I partake in activities within the theme of social inclusiveness and dialogue. Last year, we were able to hold the first dialogue platform in Lebanon for two international entities: Kosovo and Serbia. We hosted the Minister of Dialogue for Kosovo and the Chief Negotiator of Serbia. They discussed their experiences with dialogue in front of hundreds of students, religious figures, political leaders, and members of civil society. We also hosted a youth panel consisting of individuals from Albania, Holland, Uzbekistan, Turkey, and India, who discussed their experiences with dialogue and their involvement in social inclusion and change. Our second forum is now underway. The vision of the youth team is to be an effective force in exploring and resolving central human issues by facilitating harmony in conflict-ridden societies and by promoting shared values for a common good. Our values encompass the following approaches: respecting freedom and diversity, cultivating an environment of understanding and acceptance, and emphasizing moral principles to promote peace. We hope to ensure Lebanon’s historic and innate vocation to provide opportunities for peaceful settlements among nations, serve as a cross-cultural catalyst for the sharing of nonviolent experiences and practices, and propel the international community to adopt Lebanon as a universal hub for dialogue. Our objectives are to create a global dynamic platform for open cultural interaction and an effective socio-political exchange, get Lebanon recognized as a Land of Dialogue, and address the United Nations in establishing a permanent international center for dialogue and peacebuilding in Lebanon. We plan to conduct awareness campaigns to reach out to different stakeholders and the public, organize conferences, roundtables, and workshops to tackle social, economic, and cultural issues, carry out research to study imminent problems and challenges, provide scientific insights to advance appropriate resolutions, and foster academic interventions to enhance favorable public policies. The youth are an important aspect in LDI, whether in planning, promoting, volunteering or coordinating.